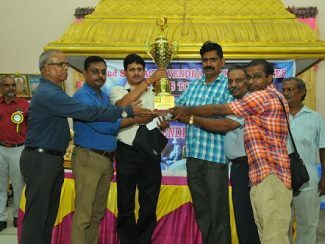 The ‎2nd edition of Sri Raghavendra Open FIDE Rated Chess Tournament 2018 was held at Sri Ganesh Thirumana Mandapam, Pammal, Chennai from 15th to 18th November 2018, organized by Sri Raghavendra Chess Academy supported by Master Mind Chess Academy with a total prize fund of Rs. 4Lakhs only. The Event was inaugurated on 15th November 2018 by Mr. Ilankumar.V, Joint Secretary, Thiruvallur District Chess Association in the presence of Mr. S.Chandrasekar, President, Master Mind Chess Academy.. In this event a total of 344 Players from 7 states and two players from USA participated and master LR.Srihari of Tamil Nadu was the top seed. 241 players were FIDE rated and 103 unrated players. After the final round, five players were in tie with same point but a better tie-break helped IM Ramanathan Balasubramanaiam to clinch the title and took the first prize fund of Rs.35,000/- and the glittering 2nd Sri Raghavendra open trophy, followed by LR.Srihari of Tamil Nadu, Mr. Sharan Sridhar of Tamil Nadu, Baraath Kalyan & Manu David S of Tamil Nadu, with 7.0 points each and placed 2nd , 3rd , 4th & 5th respectively. The Prize Distribution function was held on 18th November 2018, Shri. Muthukumar, Secretary Kanchipuram District Chess Association & Jt. Secretary TNSCA, Mr. AL. 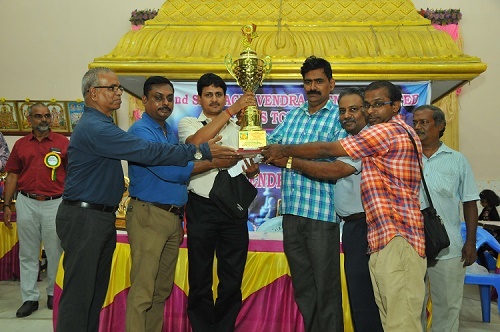 Muthu & Mr. C.V. Rajagopalan Chess enthusiasts were the Chief Guests and they gave away the Prizes to the winners in the presence of, Mr.C.Natarajan, Secretary, Master Mind Chess Academy, Mr. K.Sathyan, Director Sri Raghavendra Chess Academy; Mr.V.Ilankumar, Mr. Balaskandhan,Jt.Secs., Tiruvallur DCA, Mr.VS.Sriman. IA, Chief Arbiter of this event and all the Sri Raghavendra Chess Academy Members.